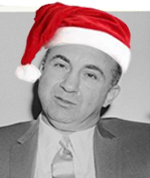 In December 1947, Mickey Cohen celebrated the relocation of his haberdashery from un-posh Santa Monica Blvd. up the hill to new digs at 8802 Sunset on the Strip, with a Christmas-themed grand-opening party. Among the guests were Jack Dragna, Cohen’s principal rival for control of the Los Angeles rackets, and Lt. Rudy Wellpott, head of the LAPD’s elite administrative vice unit, who ran another set of rackets from inside the department. Both men will play big roles in his life over the next year and a half. In August 1948, a shotgun-toting hitman hired by team Dragna will enter Cohen’s plush offices in the ground level below the haberdashery and blow the head off of one of Mickey’s bodyguards and wound another. Cohen, who was in the men’s room washing his hands when the shooting started, hid from the gunman in a stall by crouching on the toilet. In May 1949, Cohen will release recordings of phone calls that implicate Wellpott and other LAPD brass, all the way up to Chief C.B. Horrall, in gambling, prostitution and abortion rackets in the city, including Brenda Allen’s A-list bordello services on the Sunset Strip. Wellpott be forced to resign from the LAPD, but will be acquitted by a jury on bribery charges. The store, which was called Michael’s, occupied a storefront in a building Cohen purchased that occupied the southwest corner of Holloway Drive and Palm Avenue on the Strip.